The work of your soul in this life is to align yourself with your divine purpose. Alignment requires continual adjustments as you navigate your life course. Just as every new day brings new challenges, soul work requires an ongoing effort to keep you on course. 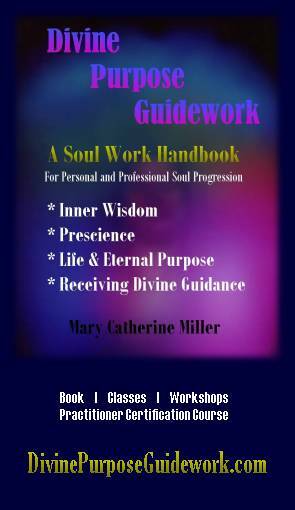 Knowing your divine purpose is the first step to your soul work for this lifetime. Many steps follow. Your spiritual evolution is the unfoldment of your creative potential. Putting your divine plan into action reflects your commitment to living responsibly as a divine being in human form. The spark of divinity resides within every soul. Aligning yourself with this inner spark is your soul work for today. Put your divine purpose into spiritual action. Refine your soul through the daily practice of alignment. Aligning yourself with the inner spark of divinity within you is your soul work. It requires continual adjustments as you navigate through life. It is trusting your inner guidance and living each moment in harmony with your heart and soul. It is knowing that you have a sacred purpose for this life and for eternity, and understanding that you already chose your divine purpose. You already agreed to it. It is your true choice, the choice of your divine immortal soul. As you live your divine purpose you are keenly aware of sacred space. You feel a little uncomfortable outside of sacred space; so you find ways to exist within sacred space wherever you go. You take the time to nurture your soul, to listen to your heart and your higher self. You find moments to reflect on decisions and directions you have chosen. You pause before you move forward with something new to ask your inner self if this new venture will keep you in this sacred space of heart and soul at peace with the world. Living your divine purpose is trusting in divine nature. It is praying, believing and knowing, all from within. An affirmation is a declaration that we affirm the validity and solemnity of a particular statement. It is our testimony of a particular truth. We use affirmation statements to remind us consciously of what we know to be true. Affirmations bring congruency to the conscious, subconscious and unconscious minds as we declare them aloud. Practice using daily affirmations to firmly plant the seeds of truth within your mind and soul. 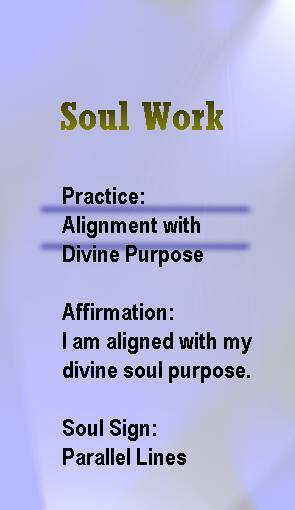 Affirmation: I am aligned with my divine soul purpose. The symbols on each affirmation card are referred to as "Soul Signs" because they are visual and mental clues to remember from within; triggers for soul memories. These are simple, basic drawings that are easily recognizable, and that ANYONE could sketch. As much as possible each symbol is recognizable beyond the need for verbal language or for any particular language and has been designed by intuitive guidance. The symbols are blurred by design, forcing the mind to create its own imagery for the symbology. These symbols are placed in the center of the card with writing that overlaps the images so that the symbol itself is not what is cemented into the mind; but the concept of the vague visual clue.